9/11. A day seared in America’s memory and spirit. 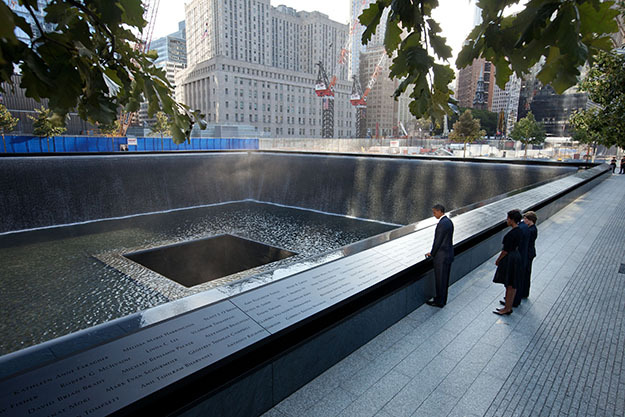 The 9/11 Memorial, built on the site of the original Twin Towers, is a place of tribute. Visitors to NYC are drawn to it, compelled to just be there. The idea of going to the memorial on a bike tour may seem a bit unusual, but it’s a wonderful way to see the sights around the financial district. Bike and Roll’s 9/11 Memorial Bike Tour does more than just go there. It’s a thoughtfully planned, total experience. The 3-hour, 5 mile bike tour, combined with a short walk and a ½ hour visit to the 9/11 Memorial, brings together city and site. The experience begins with a beautiful ride down the waterfront Hudson River Greenway, from Pier 84 all the way to Battery Park. Riding easily along the designated bike path with a well-informed guide leading the way and pointing out special sights, the city begins to feel like what it really is – a place of neighborhoods filled with vitality. The piers along the Hudson are alive with ships, parks, and places for people. To the east, the Empire State Building rises above the midtown hi-rise crowd. Chelsea’s High Line, an elevated pedestrian walkway, where people walk, read, and walk their dogs, is visible in spots. Passing by Greenwich Village is a reminder that the 1960s bohemian spirit still exists, and the lofts of trendy Tribeca are where it’s going. Where Manhattan narrows to a rounded point and the Hudson and East rivers meet, Battery Park bustles with activity. In the distance, Lady Liberty holds her torch high, and Ellis Island is a reminder of the vision and contribution of immigrants. Bikes are left at Battery Park for the guided walk through the Financial District, the neighborhood where 9/11 happened. Wall Street, the New York Stock Exchange, the Charging Bull, global banks, all symbols of NYC’s premier position in global finance. At the Memorial, walking through purposefully planted swamp white oak trees and coming upon 1 acre reflecting pools, each erected deep inside the footprint of the original Twin Towers, watching water cascading down the sides only to disappear into a fathomless square in the center, is humbling. The walk back to Battery Park is contemplative. Biking back to Pier 84, the mood changes. The ride is invigorating and confirming. The entire experience gives evidence to the resilience of New Yorkers and all Americans. What a ride!